Results from the knockout stages of the WGC-Dell Technologies Match Play. The 48th seed - who finished runner-up in the event 12 months earlier - never trailed in an uneventful final at Austin Country Club, where he registered a 3&2 win over his American counterpart. Kisner grabbed the early advantage with a 12-foot birdie at the first and salvage a bogey at the next despite finding water with his approach, as Kuchar three-putted from 15 feet. Kuchar levelled with a par at the fifth but lost the next hole and then three-putted par-three seventh to slip two behind, only for Kisner to miss an eight-footer to save par at the ninth. The lead doubled again when Kuchar found water off the 11th tee and increased further when he bogeyed the 15th, before Kisner completed his victory by holing a 20-foot birdie at the par-five next. 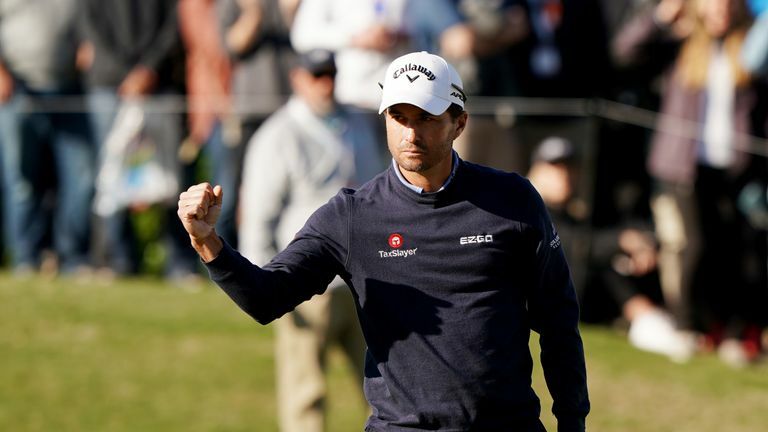 Kisner ended Francesco Molinari's unbeaten match play run earlier in the day, with the Italian bouncing back to beat Denmark's Lucas Bjerregaard 4&2 in the third-place play-off. Molinari drained a 20-footer at the opening hole and added another from half the distance at the third, only for Bjerregaard to pull a hole back with a close-range gain at the par-three fourth. Bjerregaard responded to Molinari's tap-in birdie at the sixth by holing from eight feet at the next, keeping him within two at the turn, but drifted further behind when the Open champion won the 10th and 12th holes with pars. The Dane converted from six feet at the 13th to save par and reduce the deficit but missed a five-foot birdie chance at the next, as Molinari sealed his sixth victory of the week with a par at the 16th.